So What if Volatility ETN/ETFs are Growing—Where are the Problems? It’s clear that the volatility ETN/ETFs have begun to dominate the VIX Futures market. What isn’t clear is whether it matters. Volatility isn’t a commodity like gold or corn that is physically limited, so future position limits don’t seem applicable. 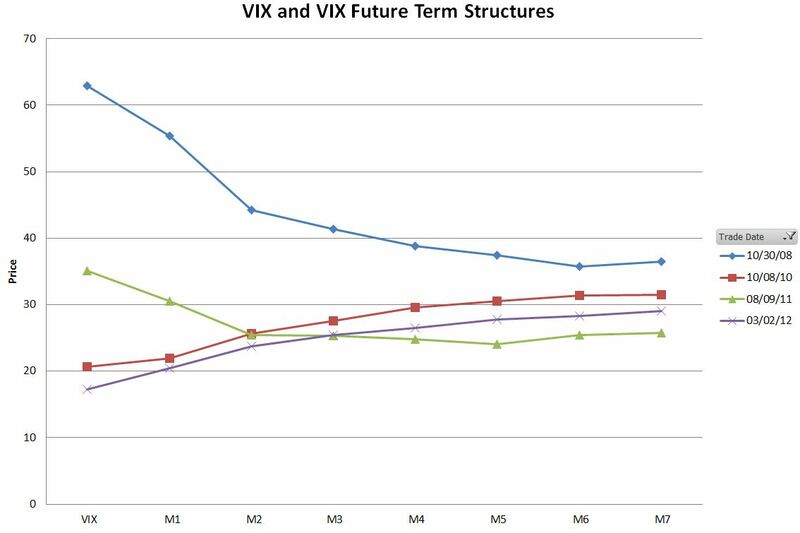 When the price of VIX futures is attractive, more can be created—and appropriate hedges put in place. But are these hedges distorting the overall market? The recent term structure doesn’t appear to be totally out of whack with the comparable period in November 2010. 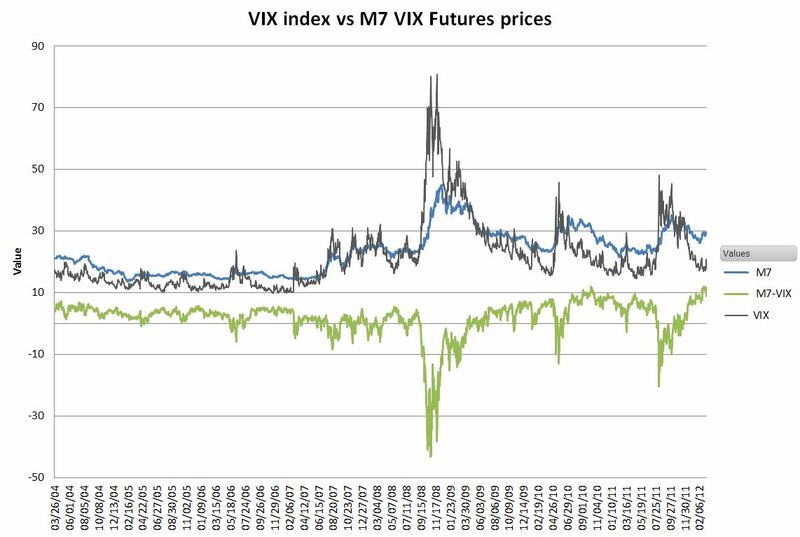 The chart below shows the relationship between the VIX index and the 7th-month VIX future (M7), with the green M7-VIX line showing the difference between the two. Compared to the 40 point negative difference in 2008 the current VIX vs M7 relationship looks pretty pedestrian. Is it a problem that Volatility ETN/ETFs now do most of the trading on the VIX Futures Market? Volatility ETN/ETFs have known trading patterns. Their prices are based on daily future rolls (selling nearer months and buying further out months) in order to preserve a constant time maturity. Can this knowledge be exploited to game the market against the ETN/ETF providers? Will the overall growth of the VIX futures market cause problems? The analysts over at IndexUniverse did a nice job of piecing together a rough estimate of the ETN/ETFs impact on the market, but the CBOE posts historic VIX futures data (price, volume, open interest) from the beginning of tracing in 2004 and I have a spreadsheet that enables me to analyze that data. 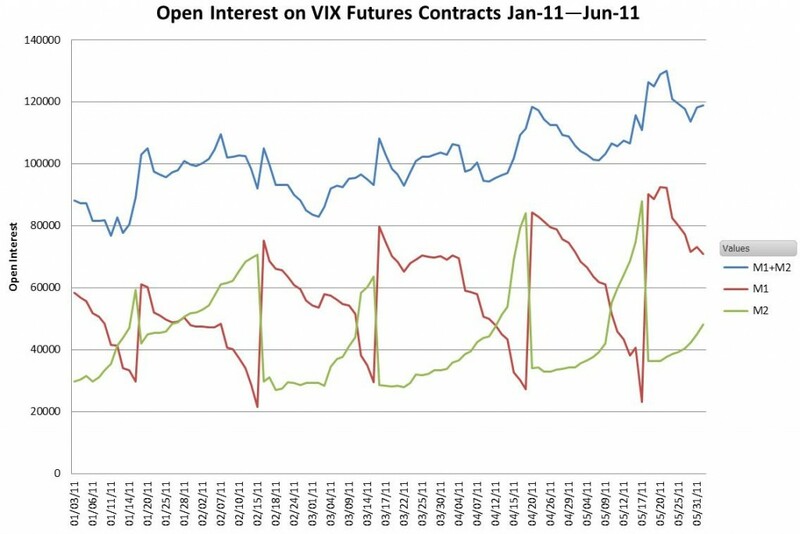 The chart below shows open interest on first (M1) and second month (M2) VIX futures during the first half of 2011. The red M1 open interest shows a big step up once a month when the previous M2 futures become the M1s at futures expiration. After the jump up the open interest on the M1s drops as the ETN/ETFs sell them and buy the M2s. You can see the green M2 line increasing and the M1 dropping. The blue line above is the combined open interest of the two—giving a reasonable measure of the overall short term VIX futures open interest. Notice that the open interest for the M1 and M2 contracts doesn’t drop below 20,000 contracts. This number has been relatively consistent since Mid 2010 and represents the institutional and retail business that isn’t locked into the daily roll cycle. In the first half of 2010, these 40K contracts were about 40% of the overall 100K in short term open interest. Barclays’ introduced the first Volatility ETNs, the short term VXX and the medium term VXZ in January 2009. This next chart shows short term VIX futures open interest in the era of the volatility ETN. Credit Suisse’s halt to TVIX share creation on February 22nd, 2012 (horizontal black bar on chart), doesn’t seem to have slowed things up. 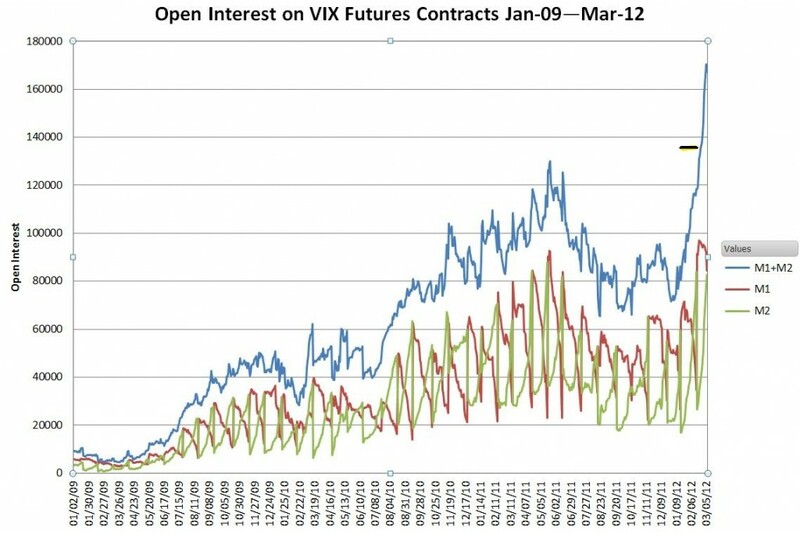 The CBOE’s March 6th announcement that they have reached a record open interest of 280,000 VIX futures contracts (including all their volatility futures) is not surprising. Clearly, the volatility ETN/ETFs (see Volatility Tickers for the full list) are on a huge growth spurt. Their volumes now dominate the VIX futures market—but so what? It wouldn’t be the first time broad retail acceptance of a product overtook the institutional/commercial market (e.g, computers). Yes, they have a characteristic monthly pattern, but the term structure doesn’t show any sign of that demand distorting the prices—I would expect a bump in the M2 prices if that was the case. Credit Suisse at least is feeling the growing pains, but so far Barclays and ProShares (the other rapidly growing fund provider) aren’t complaining. I don’t see any evidence that SPX options are behaving strangely. I understand that shifting $50 million or more a day to rebalance an ETN with a billion dollars in assets is not a trifling thing, but compared to the $10 trillion market cap of the S&P 500 this feels like a tempest in a teapot.